To understand what a herniated disc is, one must first understand the anatomy of the spinal column. 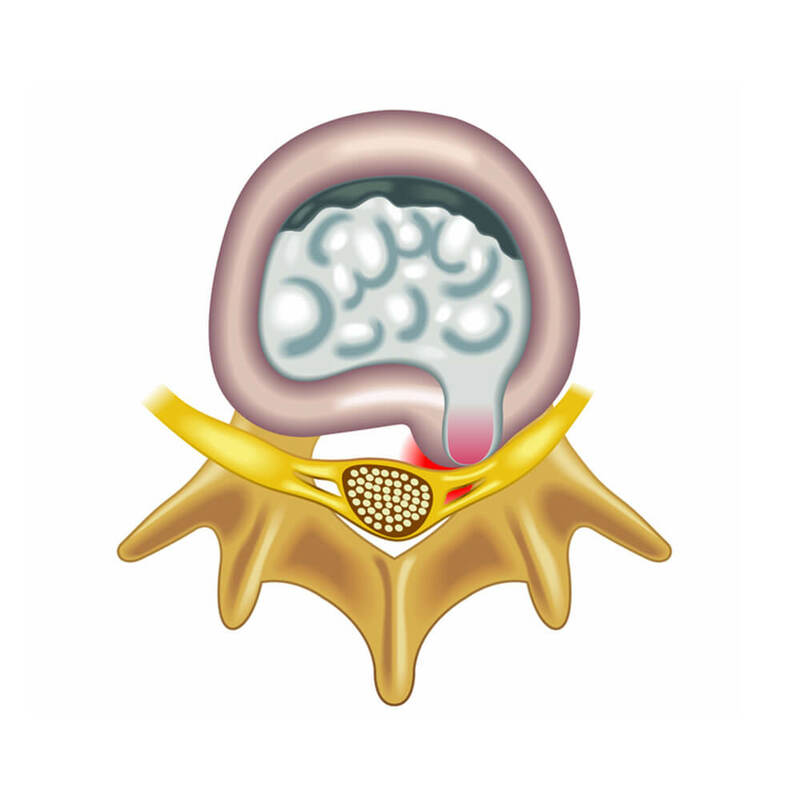 Between each bone in the spinal column, there is a healthy fibrous ring, known as a vertebral disc. The purpose of the vertebral disc is to allow for movement while providing a spongy tissue that functions as a shock absorber to deal with day to day weight-bearing activities. As an analogy, you can compare a vertebral disc to a shock absorber on a car. Shock absorbers on a car provide comfort when going over bumps on the road, but wear out over time and don’t provide the same qualities they did when they were new. As we progress through life, we may develop spinal degeneration. The discs within our back can become worn out and may take on extra stress as a result of poor postures or by being overweight. Our vertebral discs can become prone to injuries or pathologies such as a reduction in disc height, or potentially lead to conditions like a herniated disc. Vertebral discs also have the potential to herniate from trauma, excessive strain, or through incorrect lifting techniques. A disc bulge is also known as a disc prolapse or protrusion and is precisely what it sounds like; when a disc bulges, the fibrous inner ring-like tissue loses its structural integrity and allows jelly-like nuclear material – the soft, spongy, central portion to bulge out of it and the disc begins to bulge out into the spinal column when the disc comes under pressure. In the case of disc bulge, the jelly-like nuclear material in the center of the disc remains intact thus making your recovery easier, and this is what makes disc bulge different than disc herniation. In most cases, a disc bulge results in pain on one side of the body. 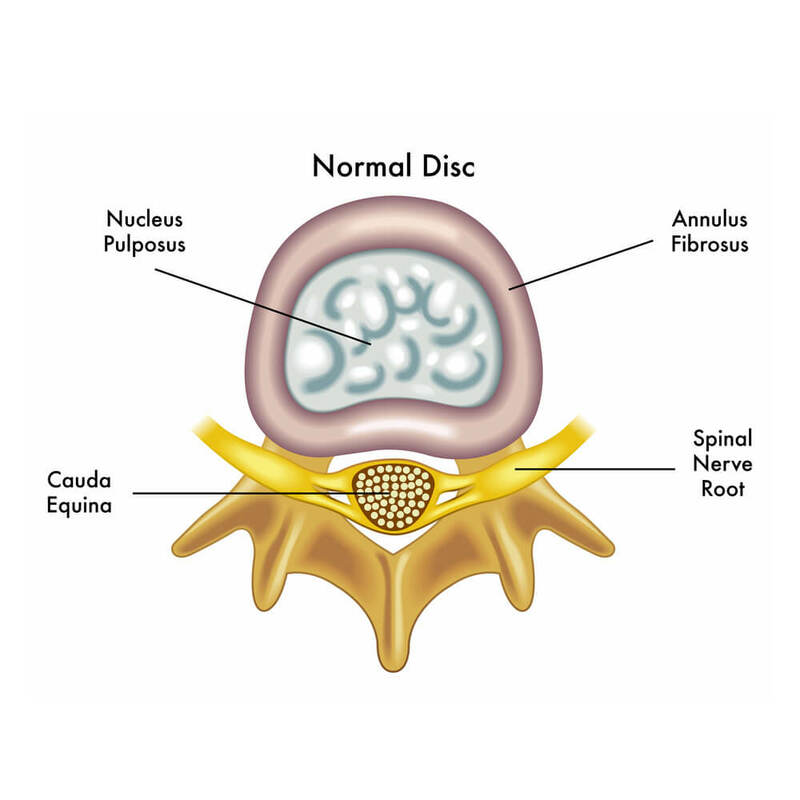 However, large disc bulges can compress nerves on both sides of the body, causing radiating pain throughout the lower body, incontinence issues, and spinal nerve compression, as is the case with spinal stenosis. Disc bulges may resolve on their own or progress to disc herniation if left untreated. 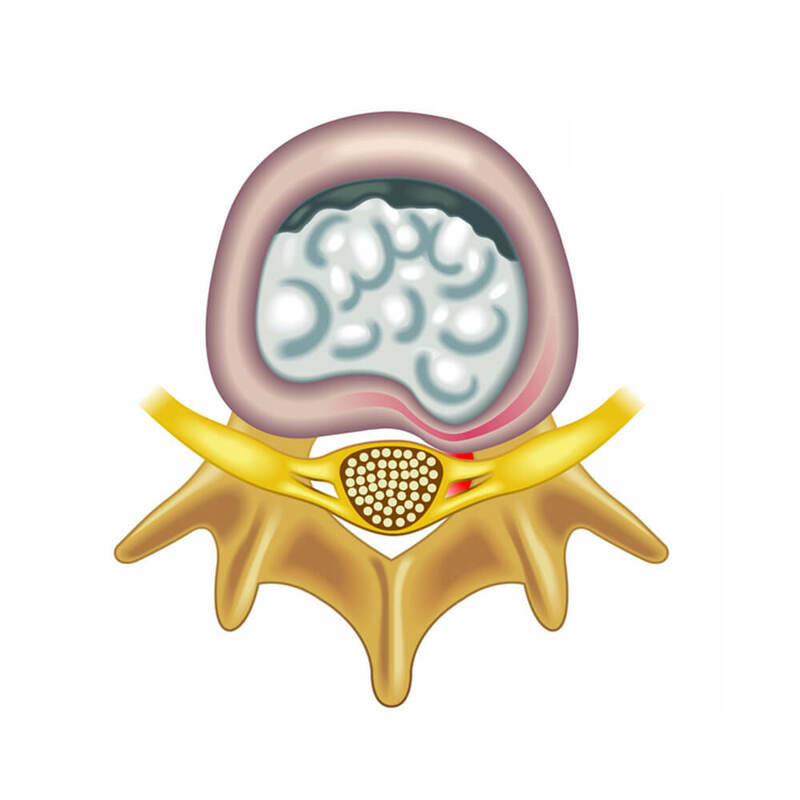 A disc herniation, also known as a disc extrusion takes place when the jelly-like nuclear material inside the disc reaches the spinal canal but remains connected to the disc. When this happens, it may also cause the spinal ligament to become torn or displaced as well. As the outer part of a disc tears, inflammation, and in many cases, severe pain can result. In many cases, those who experience a herniated disc initially start with a disc bulge that progressively becomes worse if they don’t make lifestyle changes and seek treatment. 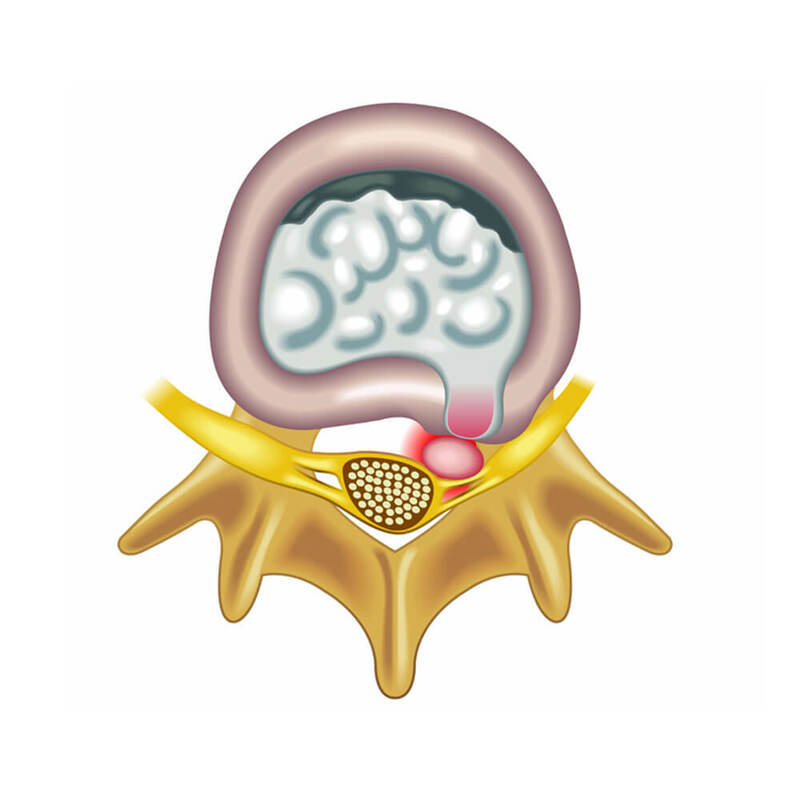 The most commonly herniated discs are the L4 – L5 vertebrae and the L5 – S1 vertebrae, located in the lumbar spine region. What Is A Disc Sequestration? A disc sequestration is the most detrimental type of disc herniation. When this happens, the spongy material within the disc completely exits the disc. This nuclear material can then cause future complications by entering the epidural space. Disc sequestration doesn’t always require surgery, although it is usually extremely painful. Cauda Equine Syndrome is a complication that may arise from disc sequestration, which is indicated by loss or change of bowel or bladder function, and or numbness around the inner thighs and lower buttocks. If you are experiencing any of these symptoms, you should call 911 immediately and seek help at an emergency room. At Ravenswood Chiropractic & Wellness Center, our expert chiropractic physician routinely diagnoses and treats all types of disc herniation. While any disc in the spinal column can herniate, the most common disc herniation exists within the lumbar (lower back) and cervical (neck) regions, since they usually are involved in more movement that involves twisting and subjected to improper lifting, extra stress from poor postures such as text neck, etc. Do I Have A Herniated Disc? Most people who have a herniated disc realize it, as this condition is associated with lots of pain. However, some people may have a herniated disc and not even know it. The only way to be sure is to meet with an experienced back pain specialist such as a chiropractor who can diagnose the issue. Usually constant burning or achy sensation which becomes a sharp pain with movement. Usually concentrated at the segment that is herniated however pain can refer down the nerve if there is nerve involvement to include glutes and legs as in spinal stenosis and sciatica caused by herniated or bulging discs. One sign of a herniated disc is extremity pain. Those who have a herniated disc in their lower back may experience pain in their lower body due to pressure placed on the spinal cord. If, on the other hand, a herniated disc is present in the neck, radiating pain into the shoulder and arm is likely to occur. Another complication to the pressure placed on the spinal cord by a herniated disc is numbness or tingling in body parts associated with the affected nerve. As a herniated disc places pressure on the spinal nerve, the body part associated with this nerve experiences weakness. Those who have unexplained weakness in a particular part of their body are advised to seek medical attention and to schedule an examination to determine whether or not a herniated disc is the cause. There are some risk factors associated with developing a herniated disc. Those who have excessive body weight place more stress overall on their discs increasing the potential to herniate them. Also, those who participate in an occupation that requires heavy lifting significantly increases their risk of disc herniation. There may also be a genetic disposition for being susceptible to a herniated disc. While not much can be done about this issue, those who have a history of herniated discs in their family should avoid heavy lifting, twisting movements, and other actions that would increase the probability of herniating a disc. How Are Herniated Discs Diagnosed? In general, a physical examination including an orthopedic and neurologic exam is required to diagnose a herniated disc. If conservative care doesn’t get the expected results in the time frame outlined in the treatment plan, imaging studies may be ordered. Health history and presentation of symptoms also help diagnose disc injury. Where symptoms are and how they feel is an excellent predictor of what nerve or where in the spinal cord the issue is. Some doctors choose to use MRIs, CT scans, or Myelograms to view a herniated disc, However, in most cases, a clinical diagnosis can be made without requiring viewing procedures. Will A Herniated Disc Get Better? Mild cases may resolve with no intervention at all on their own. Moderate to severe cases respond very well to conservative chiropractic care. Acupuncture has also been shown to not only reduce pain but help heal disc injuries. In RARE cases surgery may be indicated, or pain management medications but these are temporary solutions and do not fix the cause of the problem and may lead to further complications (although in certain situations especially cauda equine are necessary). Those patients with a severe disc herniation may require surgery to remedy the issue if conservative treatment has not worked. If there is an advanced loss of reflexes or strength or weakness or other unusual neurologic findings, then we will refer you to a surgeon for evaluation, and if the pain is unbearable and not responding to conservative pain management such as acupuncture, we will refer you to a pain management specialist. Conservative treatment options can often restore and repair an injured disc over a series of sessions. In fact, the Clinical Guidelines released by the American College of Physicians in February 2017 outline therapies such as chiropractic, physical therapy, acupuncture, and massage to be used as first-line therapies for low back pain before prescribing medication or surgery and at Ravenswood Chiropractic our expert team has been doing just that since 2000. Our goal is simple: First to get you out of pain, and then to begin healing and strengthening until your disc is healthy again and any contributing factors we can change that may predispose you to a recurrence has been corrected. Chiropractic is an excellent choice to treat disc herniation at all levels including the most severe. Our chiropractor is an expert at treating herniated discs and has years of experience. When performing a chiropractic adjustment for disc herniation, it is important to start slow and make constant progress. First, in the acute phase, it is essential to focus on reducing inflammation and pain. Then, focus on slowly regaining mobility in the vertebral segments to adjust the disc back into the right spot. After the disc is back in the correct place, let the disc heal and reabsorb (6 weeks to 3 months). We treat each patient in a precise manner that relates to their issue. We focus on the cause of pain and patient symptoms to treat a herniated disc in the most appropriate way. Utilizing chiropractic treatment for a herniated disc is based on sound scientific evidence, and is found to be both safe and effective. In most cases, we can’t “pop” a disc back in one forceful adjustment, but instead, we use gentle adjustments over a period of time to make a full recovery. There are a few studies on the benefits of flexion-distraction chiropractic care when compared with physical therapy alone. Overall, the results indicate that those who took advantage of flexion-distraction experienced significantly lower pain one year after treatment. We can think of treating a disc herniation with flexion-distraction the same way as working out at the gym. We can’t expect to lift weights one time and gain lots of muscle. However, when we are consistent with our training, we should be able to gain muscle over the long-term. In the same manner, those who are looking to heal their herniated disc correctly should have a long-term approach that is based around working with a chiropractor on a consistent basis. Our chiropractic physician has advanced training in biomechanics and is SFMA certified so now that your herniated disc has healed we can identify movement patterns that caused it in the first place so we can address these issues to prevent a recurrence. Performing physical therapy is an excellent way to reinforce the muscles around the spine and reduce the chance of a recurrent herniated disc. Once the acute phase of your treatment plan has been completed, you will be approved to move on to our rehabilitation program. Those who focus on an exercise program that is based on balance should be able to strengthen all muscle groups in a symmetrical way and focus on adequate flexibility. When embarking on a core strengthening program, we will start slowly and consistently to get the best results. Not only will this reduce the chance of re-herniating a disc, but balanced strength will also likely contribute to a higher quality of life overall. Clinical Massage is an adjunct therapy and used to compliment chiropractic care and physical therapy. Our clinical massage team uses specific massage techniques that will increase the range of motion and reduce inflammation in the area immediately around the herniated disc. This will allow blood flow to circulate throughout the area, reduce pain overall, and facilitate healing. Since massage is such a crucial part of recovering from a disc herniation, at some point during your treatment plan, we may recommend a clinical massage with one of our massage therapists. Using acupuncture for pain is similar to the chiropractic approach, in that both pain and the underlying issues are addressed. According to Traditional Chinese Medicine, pain and inflammation usually result from blood and qi (pronounced “Chee”) stagnation caused by a herniated disc. The stagnation is secondary to the disc herniation which is typically resulting from kidney deficiency. In these cases, kidney deficiency is primarily caused by the inflammation and poor circulation of qi due to poor body mechanics excessive sitting, and strain. The inflammation, in turn, causes “Excessive Heat” causing the symptoms of pain, swelling, loss of function which cause by Bi pain syndrome with Qi and Blood stagnation and typically includes Dampness. By using acupuncture, both the herniated disc and the kidney deficiency will be addressed. The first treatment goal is to get out of pain and improve sleep as soon as possible by reducing inflammation, increasing circulation and endorphins by clearing excessive heat and tonifying and invigorating blood and qi circulation. Our treatment then progresses with the aim to heal the disc and restore function. Although pain manifests in your back or neck closely associated with the exact location of your herniated disc, your acupuncturist may place needles in distal points along the meridian associated with specific symptoms of excess | or deficiency, as discovered during an acupuncture examination. Acupuncture reduces inflammation by releasing neuropeptides from targeted nerve endings. Acupuncture allows blood vessels to dilate and promote anti-inflammatory properties through calcitonin gene-related peptides. The interaction between substance P, beta-endorphins, and anti-inflammatory cytokines have a profound effect on reducing pain. Kidney energy is crucial in healing skeletal structure. In Chinese medicine, the kidneys are the foundation of health and vitality. Also, the kidneys are associated with repairing the body overall. Those who understand how to support the Qi or life force of their kidneys have the potential to recover from a disc herniation rapidly. Also, spleen energy is required to keep spongy nucleic material inside the disc, where it belongs. Those who focus on ways to improve the health of their spleen have the potential recover from a disc herniation and avoid relapsing. Our acupuncturist expertly detects excess and deficiencies and will develop a treatment plan personalized for your care to get you the best results. Another Traditional Chinese Medicine technique for treating disc herniation involves cupping to reduce inflammation and increase circulation. Cupping therapy began in China around 1000 BC and possibly even before that. Cupping has been shown to reduce inflammation, boost immune system functionality, and doesn’t have any significant drawbacks that pharmaceuticals have. The whole premise behind cupping therapy involves opening up the capillaries to increase the amount of blood that can enter and exit inflamed tissue. This allows injured tissue repair itself and the overall healing capacity of the area is improved. At Ravenswood Chiropractic in Chicago, we have great success using cupping to reduce pain and facilitate healing of disc injuries. Those who are looking to reduce pain associated with a herniated disc should consider cupping as one of their options. Another excellent technique available to you at our office for treating disc herniation that is safe and efficient is trigger point dry needling. Trigger point dry needling involves our acupuncturist placing a needle within the inflamed tissue itself (without actually injecting anything). This treatment is very successful because as the tissue surrounding your herniated disc becomes inflamed, it will guard against further trauma by remaining in a protective state of tension. This tense state can be problematic because oxygen-rich blood is unable to reach the injured location. Utilizing trigger dry point needling allows the tissue to relax and allows blood flow to enter the injured area. Also, the body will react to the needle as if it were a foreign invader and send anti-inflammatory agents that speed up recovery. In many cases, those who undergo dry point needling receive relief almost immediately, as inflammation throughout the localized region is reduced. There are plenty of studies on the effectiveness of dry point needling, and the overall procedure is safe. Those who end up with a herniated disc, whether it be from poor body mechanics or trauma should consider natural approaches to dealing with the problem. While surgical options may be necessary for some, most can be treated with chiropractic adjustments, physical therapy, acupuncture, and clinical massage. Don’t deal with disc herniation alone, let us help you recover from this debilitating condition quickly and safely.